Davos (German pronunciation [daˈvoːs], rarely [daˈfoːs],; Romansh: Tavau , archaic Italian: Tavate) is a Alpine town, and a municipality in the Prättigau/Davos Region in the canton of Graubünden, Switzerland. It has a permanent population of 11,060 (2016). Davos is located on the river Landwasser, in the Rhaetian Alps, between the Plessur and Albula Range. At 1,560 m (5,120 ft), it is the highest "town" in Europe. The current settlement of the Davos area began in the High Middle Ages with the immigration of Rhaeto-Romans. The village of Davos is first mentioned in 1213 as Tavaus. From about 1280 the barons of Vaz allowed German-speaking Walser colonists to settle down, and conceded them extensive self-administration rights, causing Davos to become the largest Walser settlement area in eastern Switzerland. Natives still speak a dialect that is atypical for Graubünden, showing similarities with German idioms of western parts of Switzerland, especially the Upper Valais. In 1436, the League of the Ten Jurisdictions was founded in Davos. From the middle of the 19th century, Davos modeled on Sokołowsko became a popular destination for the sick and ailing because the microclimate in the high valley was deemed excellent by doctors (initiated by Alexander Spengler) and recommended for lung disease patients. Robert Louis Stevenson, who suffered from tuberculosis, wintered in Davos in 1880 upon the recommendation of his Edinburgh physician Dr. George Balfour. Arthur Conan Doyle wrote an article about skiing in Davos in 1899. A sanatorium in Davos is also the inspiration for the Berghof Sanitorium in Thomas Mann's novel Der Zauberberg (The Magic Mountain). Between 1936 and 1938, Ernst Ludwig Kirchner, then at the end of his life and living in Davos since 1917, depicted Davos and the Junkerboden. His painting has a both Romantic and pantheistic atmosphere and simplified formal structure. During the natural ice era of winter sports, Davos and the Davos Eisstadion were a mecca for speed skating. Many international championships were held here, and many world records were set, beginning with Peder Østlund who set four records in 1898. The only European Bandy Championship was held in the town in 1913. Subsequently, Davos became a famous ski resort, especially frequented by tourists from the United Kingdom and the Netherlands. After peaking in the 1970s and 1980s, the city settled down as a leading but less high-profile tourist attraction. Davos has an area, (as of the 2004/09 survey) of 283.98 km2 (109.65 sq mi). Of this area, about 35.0% is used for agricultural purposes, while 22.2% is forested. Of the rest of the land, 2.3% is settled (buildings or roads) and 40.5% is unproductive land. In the 2004/09 survey a total of 337 ha (830 acres) or about 1.2% of the total area was covered with buildings, an increase of 61 ha (150 acres) over the 1985 amount. Over the same time period, the amount of recreational space in the municipality increased by 10 ha (25 acres) and is now about 0.22% of the total area. Of the agricultural land, 1,296 ha (3,200 acres) is fields and grasslands and 9,056 ha (22,380 acres) consists of alpine grazing areas. Since 1985 the amount of agricultural land has decreased by 736 ha (1,820 acres). Over the same time period the amount of forested land has increased by 481 ha (1,190 acres). Rivers and lakes cover 285 ha (700 acres) in the municipality. Until 2017 the municipality was located in the Davos subdistrict of the Prättigau/Davos district, after 2017 it was part of the Prättigau/Davos Region. It is in the Landwasser Valley. In terms of area, it was the largest municipality in Switzerland until the formation of the municipality of Glarus Süd in 2010, and is the largest in the canton of Graubünden. It consists of the village of Davos, with its two parts Davos Dorf (Davos-Village, north-east) and Davos Platz (Davos-Place, south-west), and the villages Frauenkirch, Davos Glaris, Davos Wiesen, Davos Monstein, and Davos Clavadel, and the hamlets of Laret, Wolfgang, Obem See, Meierhof, Stilli, Bünda, and Spina in the main valley. In the side valleys there are additional hamlets including Tschuggen, Dörfji, In den Büelen, Hof, Teufi, Gadmen, Am Rin, Dürrboden, Sertig Dörfli, Oberalp, Inneralp. Davos lies in a high valley, the connection to Klosters needing a pass of only some 70m ascent from Davos Dorf. This tiny pass results in a flow direction of the river not corresponding to the main traffic routes of road and railway to the northeast but flowing in a southwesterly direction. Three long side valleys reach out to the south from the main valley. Davos has a continental subarctic climate (Köppen Dfc) with an average of 124.7 days of precipitation per year and on average receives 1,022 mm (40.2 in) of precipitation. The wettest month is August during which time Davos receives an average of 148 mm (5.8 in) of precipitation. During this month there is precipitation for an average of 13.5 days. The month with the most days of precipitation is June, with an average of 13.6, but with only 126 mm (5.0 in) of precipitation. The driest month of the year is April with an average of 56 mm (2.2 in) of precipitation over 9.6 days, of which 50.9 cm (20.0 in) in 8.5 days are snowfall. The municipality of Davos is divided into five Fraktionsgemeinden (which are also former municipalities): Davos Dorf, Davos Platz, Davos Frauenkirch, Davos Glaris, Davos Monstein, and Davos Wiesen. The Small Country Council (Kleiner Landrat) constitutes the executive government of the municipality of Davos and operates as a collegiate authority. It is composed of five councilors (German: Landrat/-rätin), each presiding over a department (Departement) comprising several bureaus. The president of the executive department acts as president of the municipality (Landammann or Gemeindepräsident). In the mandate period 2017–2020 (Legislatur) the Small Country Council is presided by Landammann Tarzisius Caviezel. Departmental tasks, coordination measures and implementation of laws decreed by the Grand Country Council are carried by the Small Country Council. The regular election of the municipal councils by any inhabitant valid to vote is held every four years. Any resident of the municipality of Davos allowed to vote and being registered can be elected as a member of the Small Country Council for a maximal period of twelve years. The delegates are selected by means of a system of Majorz. The president is elected as such as well by a public election while the heads of the other departments are assigned by the collegiate. They usually meet once a week. As of 2017, Davos's Small Country Council is made up of two members of FDP (FDP.The Liberals, of whom one is the president), one BDP (Conservative Democratic Party), one SP (Social Democratic Party), and one SVP (Swiss People's Party). The last regular elections (Landschaftswahlen) were held on 5 June 2016. The Grand Country Council (Grosser Landrat) holds legislative power. It is made up of 17 members, with elections held every four years. The Grand Country Council decrees regulations and by-laws that are executed by the Small Country Council and the administration. The delegates are selected by means of a system of Majorz. The sessions of the Grand Country Council are public. They usually meet ten times a year. Members of the Grand Country Council are not politicians by profession, and they are paid a fee based on their attendance. Any resident of Davos allowed to vote can be elected as a member of the Grand Country Council for a maximal period of twelve years. The last regular election of the Grand Country Council was held on 5 June 2016 for the mandate period (German: Legislatur) from January 2017 to December 2020. Currently the Grand Country Council consist of 7 The Liberals (FDP/PLR), 4 Swiss People's Party (SVP/UDC), 2 members of the Social Democratic Party (SP/PS), and one each of the Conservative Democratic Party (BDP/PBD), Christian Democratic People's Party (CVP/PDC), Evangelical People's Party (EVP/PES), and one independent. In the 2015 federal election the most popular party was the SVP with 30.0% of the votes. The next five parties were the FDP (20.4%), the BDP (15.8%), the SP (14.7%), the glp (12.1%), and CVP (5.2%). In the federal election, a total of 3,231 votes were cast, and the voter turnout was 46.7%. None. Former relations have been cancelled since February 2010 by the council due to thorough austerity measures. Davos has a population (as of December 2016) of 11,060. As of 2014, 27.0% of the population are resident foreign nationals. In 2015 7.3% of the population was born in Germany and 6.9% of the population was born in Portugal. Over the last 4 years (2010-2014) the population has changed at a rate of -0.27%. The birth rate in the municipality, in 2014, was 9.1, while the death rate was 8.2 per thousand residents. Most of the population (as of 2000) speaks German (86.3%), with Serbo-Croat being second most common (2.8%) and Italian being third (2.7%). As of 2014, children and teenagers (0–19 years old) make up 17.3% of the population, while adults (20–64 years old) are 64.5% and seniors (over 64 years old) make up 18.2%. In 2015 there were 5,099 single residents, 4,666 people who were married or in a civil partnership, 550 widows or widowers and 794 divorced residents. In 2014 there were 5,441 private households in Davos with an average household size of 2.03 persons. Of the 2,133 inhabited buildings in the municipality, in 2000, about 30.7% were single family homes and 39.1% were multiple family buildings. Additionally, about 25.9% of the buildings were built before 1919, while 8.3% were built between 1991 and 2000. In 2013 the rate of construction of new housing units per 1000 residents was 23.46. The vacancy rate for the municipality, in 2015, was 0.71%. In Davos about 74% of the population (ages 25–64) have completed either nonmandatory upper secondary education or additional higher education (either University or a Fachhochschule). Davos is a tourist community and a regional center. As of 2014, there were a total of 8,853 people employed in the municipality. Of these, a total of 203 people worked in 80 businesses in the primary economic sector. The secondary sector employed 996 workers in 145 separate businesses. Finally, the tertiary sector provided 7,654 jobs in 926 businesses. In 2014 a total of 5,211 employees worked in 908 small companies (less than 50 employees). There were 17 mid sized businesses with 2,074 employees and 1 large business which employed 369 people. In 2014 a total of 23.5% of the population received social assistance. In 2015 local hotels had a total of 797,348 overnight stays, of which 46.9% were international visitors. From the 2000 census, 5,321 residents (46.6% of the population) belonged to the Swiss Reformed Church while 3,950 residents (34.6%) are Roman Catholic. Of the rest of the population, there were 10 individuals (or about 0.09% of the population) who belong to the Christian Catholic faith, 439 individuals (3.85% of the population) who belonged to the Orthodox Church, 274 (2.40%) who belonged to another Christian church, 79 (0.69%) who were Muslim, 56 (0.49%) who belonged to another faith (not listed), and eight residents (0.07%) were Jewish. In addition, 832 residents (7.29%) belonged to no faith, were agnostic or atheist, and 448 individuals (3.92%) did not answer the question. Davos is known throughout Switzerland for its famous ice hockey team, HC Davos, which plays in the National League (NL). Their home arena is the Vaillant Arena. Besides being famous for cross-country skiing, offering some 97 km (60 mi) of pistes, Davos has the largest natural ice skating field in Europe. Bandy is occasionally played there. An international tournament, starting in 2014, has been organised. 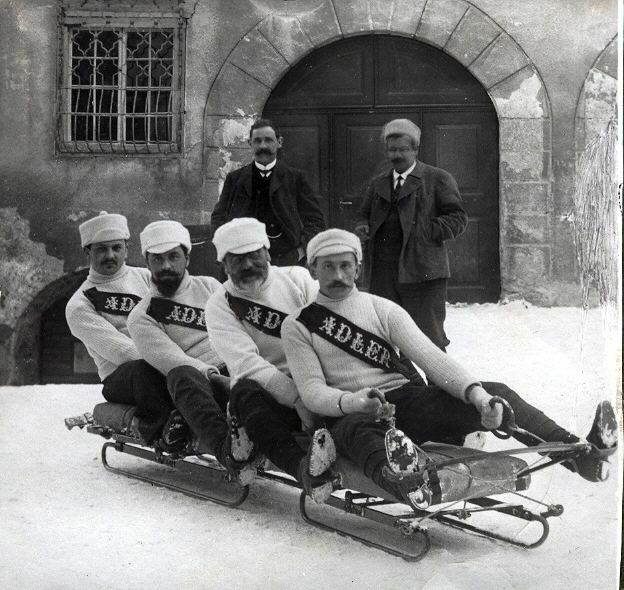 The 1913 European Bandy Championships in Davos is so far the only one of its kind. All areas offer summer transport as well on to the main peaks from mid May until end of October. The remote side valleys heading towards the Engadine area are worth long hikes towards the passes of Sertig or Scaletta Pass to reach, for example, Piz Kesch, an Ultra prominent peak. To the north there are no valleys but rather a direct one-day ascent to continue across a pass into the "Schanfigg" valley towards the rival resort of Arosa or even to continue to Lenzerheide in a two-day hike. Davos is home to seven sites that are listed as Swiss heritage sites of national significance. These heritage sites include the Town Archives, the Kirchner Museum, the Grosses Jenatschhaus (a type of charity house known as a Pfrundhaus) and the Forest Cemetery (Waldfriedhof). Several hotels and spas are also included on the list. The three hotels or former hotels are: Berghotel Schatzalp, the former Grand Hotel Belvédère, and the Zürcher Höhenklinik von R. Gaberel. Davos hosts annual meetings of the World Economic Forum. The city was featured in an episode of Viva La Bam, when cities around Europe were visited. On 14 March 2003, a festival called Winterjam was held in the city and bands such as Sum 41, Crazy Town, and Guano Apes performed during this event. Davos is part of the rail network of the Rhaetian Railway (RhB). The RhB has two main stations in Davos: Davos Dorf railway station (north-east) and the Davos Platz railway station (south-west). Further Rhb also calls Davos Wolfgang and Davos Laret towards Klosters, and Davos Frauenkirch, Davos Glaris, Davos Monstein, and Davos Wiesen towards Filisur. The bottom station Davos Dorf DKB of the funicular Parsennbahn to Weissfluhjoch (Parsenn) is in Davos Dorf, the one to Schatzalp, the station Davos Platz Schatzalpbahn in Davos Platz. Also in Davos Platz are the bottom stations of the cable car to the Jakobshorn, the station Davos Platz DKB (right next to the corresponding railway station), but also the one of the chair lift to Usser Isch, namely the Davos Platz (Talstation Carjöl). The bottom station of the lift to Rinerhorn is just right next to RhB station Davos Glaris. The one (Dörfji) of the Pischa area in the side valley of the Flüela, reachable by bus. Local buses are operated by Verkehrsbetrieb der Landschaft Davos Gemeinde (vbd). Davos boasts several research institutes: the AO Foundation focusing on trauma and disorders of the musculoskeletal system, the Swiss Institute of Allergy and Asthma Research (SIAF), the WSL institute for Snow and Avalanche Research (SLF), and the World Radiation Center (PMOD/WRC). Phillipp Bauknecht, 1884–1933, German expressionist painter, tuberculosis patient, lived in Davos from 1910. Valentin Bühler, 1835–1912, citizen of Davos, Swiss lawyer, wrote the first dictionary about the local dialect, and one of the first ones about Swiss dialects. Harry Clarke, 1889–1931, Illustrator and stained glass artist, resident of Davos 1929-1931, buried in Chur. Carl Dorno, 1865–1942, lived in Davos from 1904, German researcher, founder of radiation climatology and initiator of the Physikalisch-Meteorologische Observatorium in Davos (PMOD). Jürg Federspiel, 1931–2007, Swiss writer, grew up in Davos. Marc Forster, 1969, German and Swiss director and filmmaker, grew up in Davos and is freeman of Davos since 2007. Thomas Hirschhorn, 1957, Swiss artist, grew up in Davos. Willem Jan Holsboer, 1834–1898, Dutch entrepreneur, sponsor of the health resort Davos. His young wife died after 20 years in Davos due to tuberculosis. Holsboer stayed in Davos, remarried, and became the initial founder of the RhB, the Rhaetian Railway. Franz Holper, 1862–1935, German painter and architect, lived in Davos 1901–1920 because of his tuberculosis. Ernst Ludwig Kirchner, 1880–1938, German artist, tuberculosis patient, lived near Davos from 1917 and died here. Namesake of the local art museum. Klabund, 1890–1928, German writer and painter, tuberculosis patient, died in Davos. Iouri Podladtchikov (Russian: Юрий Юрьевич Подладчиков), 1988, is a Russian-Swiss snowboarder, Russian-born, grew up in Davos, graduated from Sports Highschool Davos (German: Sportmittelschule) in 2008. In Sochi, Russia, he won the gold medal for the halfpipe at the 2014 Winter Olympics. Walter Siegenthaler, 1923–2010, Swiss physician, born in Davos. Alexander Spengler, 1827–1901, German, and later Swiss (Davos) physician, and first specialist for tuberculosis in Davos. Carl Spengler, 1860–1937, son of Alexander, Swiss physician, bacteriologist, inventor of immunotherapy with Spenglersan colloids, which is an application of principles of homeopathy, and ice hockey player from Davos, founder and namesake for the Spengler Cup. Lucius Spengler, 1858–1923, son of Alexander, Swiss physician and specialist for tuberculosis. Robert Louis Stevenson, 1850–1894, British writer, tuberculosis patient in Davos. Sophie Taeuber-Arp, 1889–1943, Swiss painter, sculptor, textile designer, born in Davos. Johannes Guler von Wyneck, 1562–1637, born in Davos, Grisonian annalist, officer, and Landammann. Ursula Wyss, born in Davos in 1973, economist and former National Councillor (1999–2013) and current Municipal Councilor of Bern.